Because everyone loves being tagged! Thanks guys! But then I realised: I really don't watch much TV. I've never even seen Supernatural! I know. I'm pretty unusual, as fangirls go. Yes, I am obsessed with BBC Sherlock, but apart from that, I'm in no TV fandoms. I enjoy a bit of How I Met Your Mother and The Big Bang Theory, and I love Miranda, but beyond that ... Great British Bake-off, anyone? Wimbledon? I just don't watch TV! Of course, film characters also count, but then Rachel dreamed up a better plan. So behold! 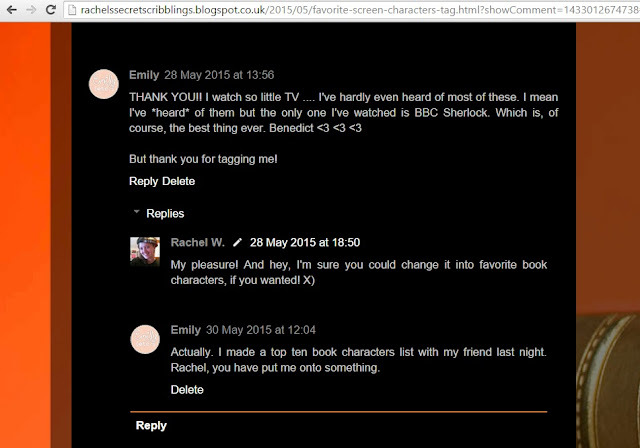 The totally legitimate Top Ten Favourite Book Characters tag! He looks about 17 here but oh well. 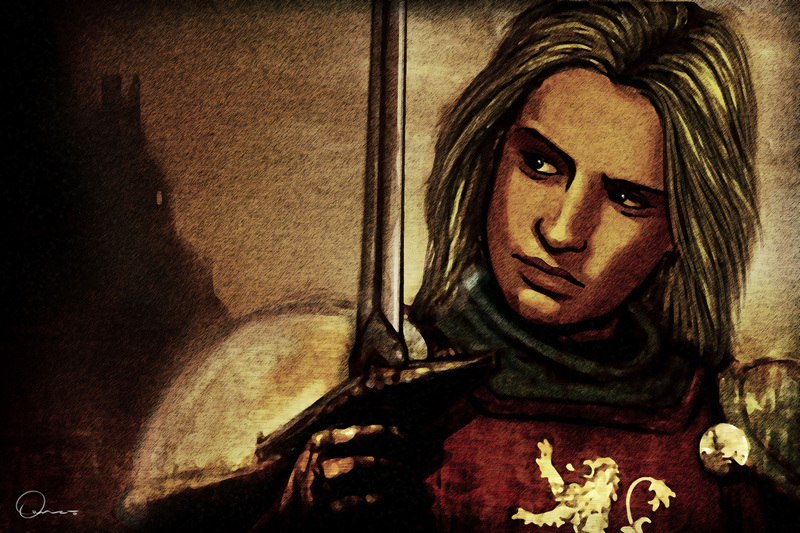 Jaime is an incredible creation of George RR Martin's, in that my opinion of him has changed so drastically over the course of the books. He's a pitch-perfect example of how to develop a character; how to go from hating to loving. It's a strong a fictional love as I've ever had. You know. Getting super excited when it's a chapter from his POV. We've all been in love with fictional characters. Right now, I very much am. In the first book, I was disgusted by his incestuous carryings-on. He had no respect for anyone, especially Ned. He was a kingslayer and an arrogant toerag. But suddenly, in A Storm of Swords, he changed in my eyes. It was his friendship with Brienne - initially he was so cruel to her, but then I began to see his honour - and his love for Tyrion, when no one else had any. I realised that he is brave, can be kind, has been in some very bad situations, and I know that he is misunderstood. And I love him. 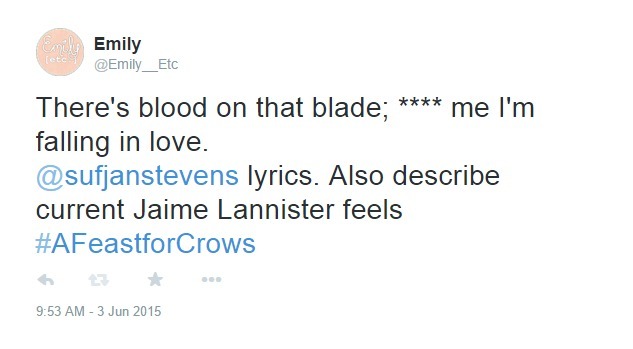 I'm also desperately and innapropriately shipping him with Brienne. Can anyone relate to this?? I've talked about my love for Gatsby before. After not really enjoying the book on my initial reading, I studied it in school and now it's probably top 5 favourite material. 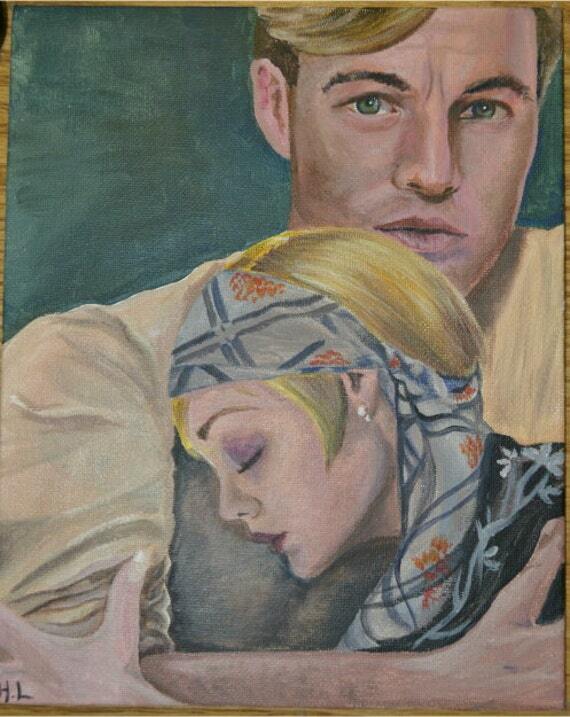 I absolutely love the character of Gatsby, as tragic and beautiful a tragic hero as ever there was. "He had an extraordinary gift for hope." "a promise that the rock of the world was founded securely on a fairy's wing." Daisy, his lover, is a witch, but Gatsby doesn't give up on her. His story is heartbreakingly beautiful. "He must have felt that he had lost the old warm world, paid a high price for living too long with a single dream. He must have looked up at an unfamiliar sky through frightening leaves and shivered as he found what a grotesque thing a rose is, and how raw the sunlight was on the scarcely created grass." What? Yes, yes this is cheating. Yes, this is three for one. Don't question me. I love Harry with an enduring love. He goes through so much. He is so brave. He is so selfless. Not to mention his excellent fighting skills and extreme sass. Hermione is my queen forever. I love how she's so clever, so bookish, so hardworking. I love her role in the trio: the planner, the eye-roller, the brains behind most operations. I especially love how she's a Gryffindor, despite being so clever, because she shows that the stereotypical divides of Gryffindor-brave/Ravenclaw-clever/Hufflepuff-nice/Slytherin-evil are totally not how the houses are defined. She is so strong; one of the best female characters in modern literature. Ron I absolutely adore. I hate how he's viewed as the hopeless member of the trio, because he is so strong and completely necessary to keep Harry and Hermione sane. I have always loved Ron a lot. 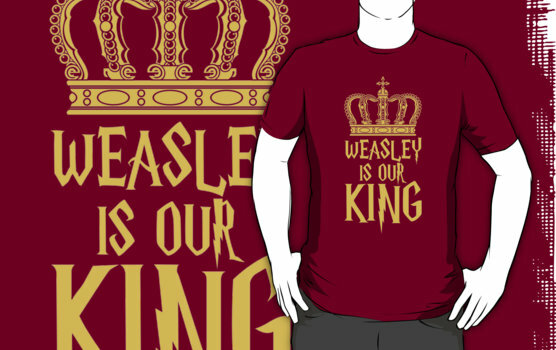 You have no idea how much I want this T-shirt from Redbubble, Anyone feel free to send it to me, anytime. Tied with Hermione, Anne (of Green Gables) is my favourite female character. She's so bright and cheerful and kind, and she just has this overwhelming joy. She feels things so deeply, and sees so much beauty in the world. She's everything I want to be. 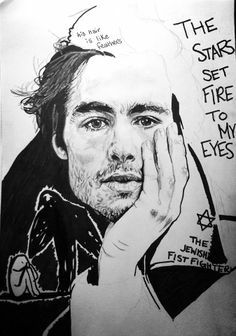 I really really really love Max: how quiet and brave he is, his drawings and his writing. The Book Thief is so due a reread. Mr Knightley, from Austen's Emma. Having thought long and hard, I have concluded that Emma is, in fact, my favourite Austen -- yes, even over Pride and Prejudice. And the reason? This man. Girls say they're looking for their Darcy - but Darcy is stroppy and arrogant! (I mean, I love him, but he is.) Knightley is perfect. Forget searching for Darcy, I'm searching for my Knightley! "Emily, that's another two in one! Stop cheating!" The Roman Mysteries by Caroline Lawrence was my favourite series when I was younger and, having recently revisited it, I can confirm that it is indeed absolutely excellent. In a literary world that sees very few strong female friendships, Flavia and Nubia are marvellous best friends. I love their relationship (even though they can be horrible to each other), and their detective skills. They are so great. Gansey, from The Raven Cycle by Maggie Stiefvater, is one of my main fictional crushes (and a lot more straightforward than Jaime Lannister!). He is so cool, yet so vulnerable. I LOVE his and Blue's relationship (I will go down with this ship). I love his mix of the Confident One, and yet the bookish and sometimes fragile one. I love how he manages the volatility of Adam, Ronan and Noah (and Blue sometimes). I love his quest for Glendower. I just love him. Did I ever mention how I am violently in love with Skulduggery Pleasant and he is pretty much my favourite character ever? He is hilarious and sassy, and yet behind all this arrogant bravado there is this vulnerable and hurt individual who is extremely brave and noble and loving. (Which, come to think of it, is also a description of Jaime and Gansey and Valentin Rusmanov and Dave the Laugh, AKA my other main fictional crushes.) 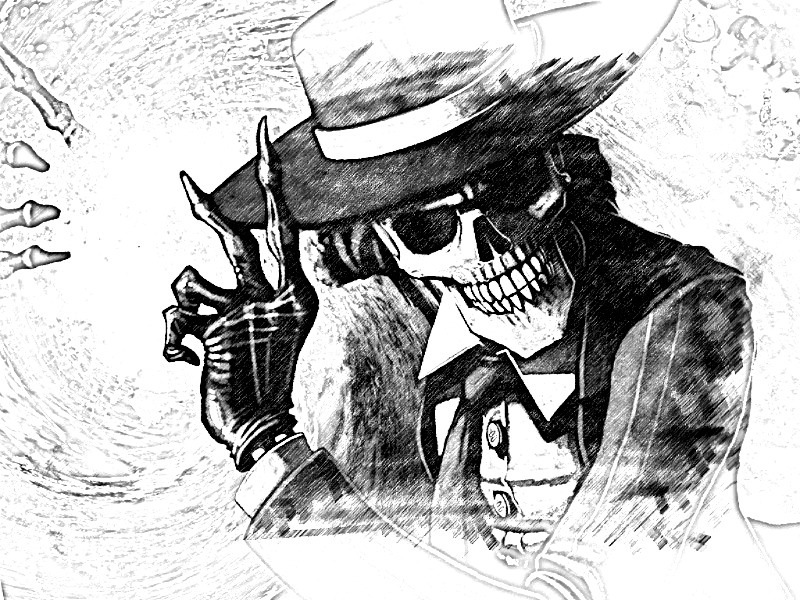 Skulduggery is perfection. I love him deeply. WELL! 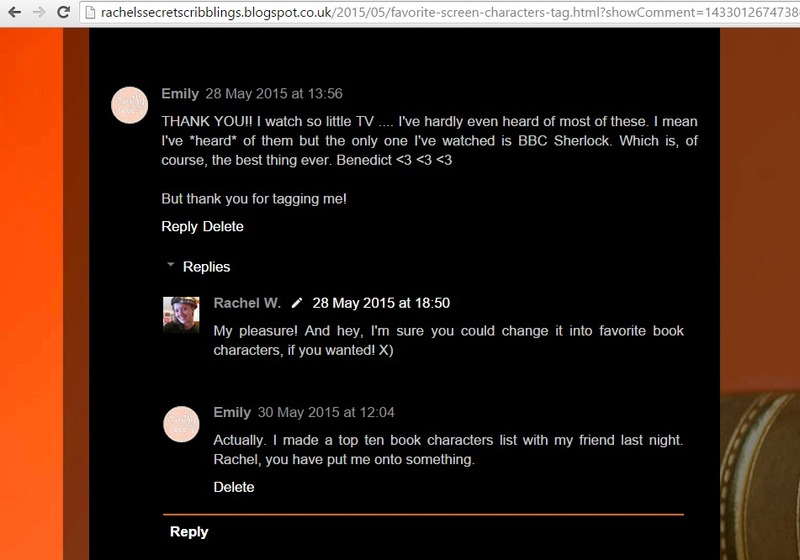 That was a lot of gushing and a lot of discussion of fictional crushes. (I do have, you know, a real life with real people as well.) But tell me: do you like any of these characters? (There is a correct answer and that is "yes".) Which of these books have you read? And now, because this is after all a tag .... mwahaha! Top ten favourite book characters tag - you're it! Omg, You like Jaime Lannister?!! HOW IS THAT POSSIBLE. Granted, I'm only on book 2, but I quite hate him. Not compared to a lot of other characters, but I do loathe him. >.> ERK. I hope my opinion changes too!! 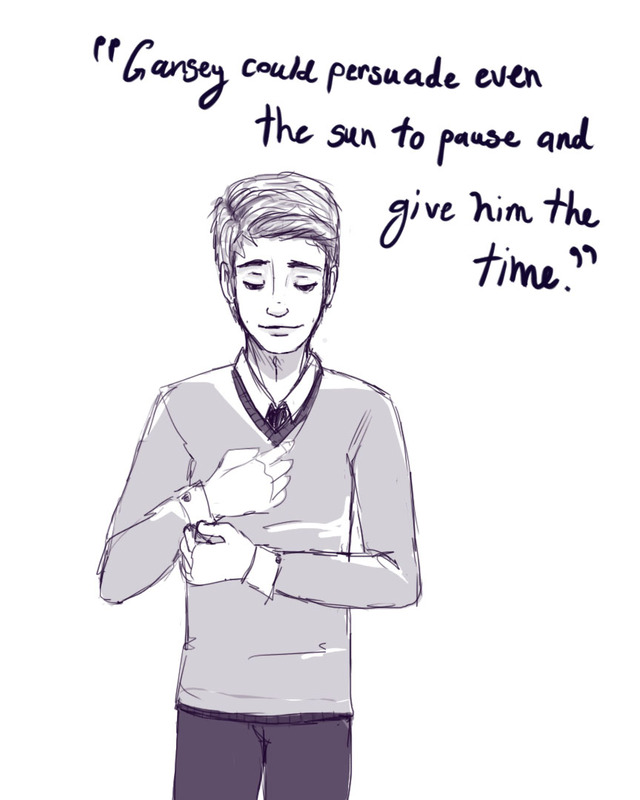 Gansey. Actually. I am so worried. I am so so so so worried. Oh Gansey my Gansey! Cait. He is actually a study in how to develop a character and change the reader's opinion. 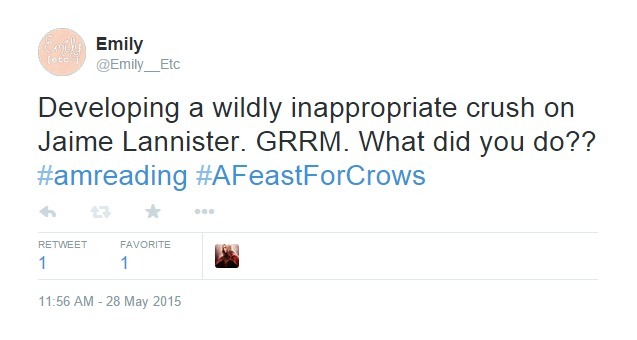 GRRM is a genius king. By the time you're on Storm of Swords part 2 you'll be liking him and by a Feast for Crows you'll be creepily obsessed (like me). I love the variation that you did with it! Anne Shirley and Gansey are some of my favourites too. Gatsby is an interesting choice. He's one of those characters that I was super interested in, but I'm not sure if I actually LIKE him. But are any characters in Gatsby really likable? Also, all this talk about Skulduggery makes me want to read those books. Anne and Gatsby are marvellous. As for Gatsby, I didn't particularly love him on my first reading, but after studying it I was just bowled over! YES YOU SHOULD. That is all. It was pretty difficult! My longlist was very, very long ... so was my shortlist ... ! Yes, I had to count the trio as one or else it would have just ended up an HP characters appreciation post ... not that that would be a bad idea ... ;) And of course, Anne the Queen had to make an appearance! You've reminded me how much I need to check out the Skulduggery Pleasant books! You are very welcome, I'm glad you enjoyed! YES YOU DO. Just sayin'. Great! Haha yes it was pretty difficult! MAX! FRED! HARRY! RON! HERMIONE! GATSBY! --- GAH! Anyhoo, thank you for tagging me! ( and thank god you changed that to books, because TV?... all I watch is Big Bang and Grey's Anatomy...) I will do it eventually. Whenever I have time. I also must still do that book cake tag from last November (....I know! I'm sorry. I'm a terrible person.... ) but I solemnly swear that I will do it! You're welcome! (You're also welcome. I feel that. I was thinking of my list: Sherlock ... um ... Spiderman ... Sheldon ... um ... ) Haha wow, I had definitely forgotten about that! I do vaguely remember the questions though. Sugar - sweet book ... etc. Don't worry though! Don't do both (or, in fact, either) if you don't want to! I randomly remembered that someone tagged me and had to go hunting. I haven't heard of all of these people. But Anne Shirley is awesome! She always dreams and also says things so well. Plus her imagination is the best. 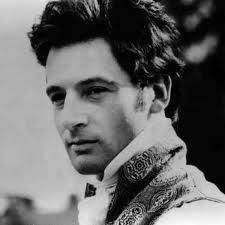 Mr. Knightley! I haven't read the book yet, but the movie was still very good. *cough* I always forget his first name is George! But I do love Knightley. He's the definition of a gentleman. I love the part when he and Emma are practicing archery, she gets upset and he advises her not to shoot his dogs with a smirk. Also the part when he talks about how much he hates dancing that he'd rather go fetch sticks and Emma says she'll remember to bring one for him. XD But I don't know if that's actually in the book. . .
She is so awesome! I love that she's a dreamer. Most of these people are, come to think of it ... what does that say about me? He is amazing. I don't remember either of those parts ... I'm pretty certain there is no archery involved, and I think I'd remember any stick-related sass. I'm not sure, though. I need to reread! And you need to ... um - read! The Golden Trio is, well, GOLDEN!! They are the trio to win at trio-ing. I love George Knightly so much!! He's swoony and he never puts up with Emma's crap. I love how honest and self-respectful he was!! Gansey is quite the character. He just draws you in like no other. Nice post! The trio to end all trios. Knightley is bae for those very reasons. I love his and Emma's relationship SO MUCH!! Also Gansey. I love how we, like Blue, start off thinking he's overconfident rich kid but BAM we can't help but fall for him. It's a hard decision making process! SKULDUGGERY! I found the third book for £1.29 in a charity shop the other day, and I have the second and fourth from secondhand stores as well, so I tell you, it can be done! Keep trying! Finally! Someone else who adores Knightley over Darcy! I am so with you! I don't watch much tv either(but I would sooo recommend BBC's Merlin to you, no matter who you are) so I like how you transformed the tag :) I love all the HP characters. And Anne Shirley! Good choices. Hmm, interesting. I know that a lot of people love Merlin. Ugh. Maybe I just need to cave and get Netflix. HP has a frankly outstanding cast. 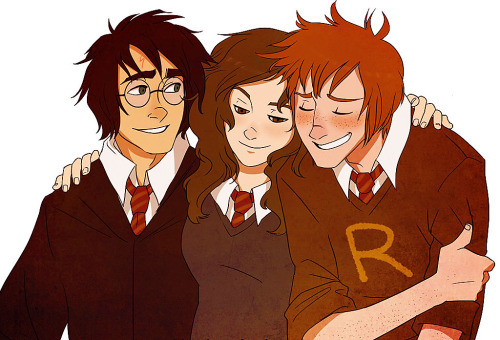 The Golden Trio and Fred have to be my favourites, but there are so many that I love. Such a high level of characters throughout! And Anne Shirley is, of course, amazing.